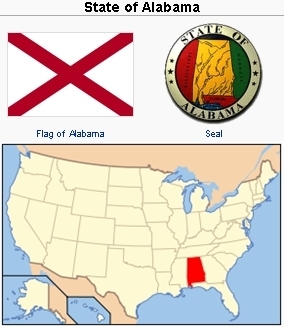 Alabama is located in the southern region of the United States of America. It is bordered by Tennessee to the north, Georgia to the east, Florida and the Gulf of Mexico to the south, and Mississippi to the west. The total area of the state is 52,419 square miles (135,765 km²), and the estimated population in 2008 was 4,661,900. In 2005 72.14% of the population were White and 26.70% were African-American. In 1945 the Eastern Mennonite Board of Missions and Charities (now Eastern Mennonite Missions) began the first Mennonite mission work in in Alabama in Escambia County near the Florida border. In 1999 there were 16 Mennonite congregations in Alabama, representing four different conferences; one congregation was independent. The Lancaster Mennonite Conference (MC) had ten congregations with total membership of 328. One of the congregations was also a member of the African American Mennonite Association, and two were members of the United Native Ministries Council. Gulf States Mennonite Fellowship (45 members) and the Brethren in Christ each had one congregation. The Church of God in Christ Mennonite (Holdeman) and Beachy Amish Mennonite Fellowship each had two congregations. An elementary and high school at Atmore sponsored by the Mennonite Christian Fellowship had 45 students. Dagen, Paul. Seedtime and Harvest. Lancaster, Pa.: the Author, 1988. Sawatzky, Reynold and Richard D. Thiessen. "Alabama (USA)." Global Anabaptist Mennonite Encyclopedia Online. February 2009. Web. 26 Apr 2019. http://gameo.org/index.php?title=Alabama_(USA)&oldid=132291. Sawatzky, Reynold and Richard D. Thiessen. (February 2009). Alabama (USA). Global Anabaptist Mennonite Encyclopedia Online. Retrieved 26 April 2019, from http://gameo.org/index.php?title=Alabama_(USA)&oldid=132291. Adapted by permission of Herald Press, Harrisonburg, Virginia, from Mennonite Encyclopedia, Vol. 5, p. 12. All rights reserved. This page was last modified on 16 July 2015, at 14:07.